There are very few people in this world who don’t have a soft spot in their hearts for chocolate. Ancient Aztecs believed chocolate was godly, early Europeans believed chocolate was a medicine, and we believe chocolate is romantic. Right before Valentine’s Day every year, some scientific group publishes a study about how chocolate has shown to boost your mood, relieve your pain, and protect your heart. But let’s face it, most chocolates on the market these days are chocked full of fats and sugars. So how can you capitalize on chocolate’s positive attributes without falling victim to its negative ones? Not only is moderation the key to successful nutrition, but balance is as well. If you’re going to eat your chocolate, then you may as well balance it out with a healthy ingredient that boosts its nutrition and compliments its flavor. The flavors of pomegranate and chocolate go together beautifully because the tartness of the fruit balances out the sweetness of the cocoa. Since desserts sometimes require you to follow the exact recipe to maintain form and texture, it might be difficult to mix the juicy fruit in when you want to. Plus, those pomegranate seeds can be a real pain to remove if you’re in a rush. Fortunately, the texture and consistency of our pomegranate powder works well when mixed with desserts, drinks, and even ice cream. You can easily add an antioxidant punch to your fruit smoothie, juice, or tea by adding a spoonful or two of pomegranate powder. You can also mix the flavorful powder in with your favorite chocolate dessert and sorbet recipes. 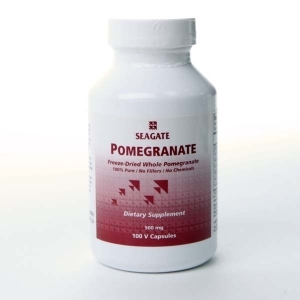 Clinical studies have linked pomegranates to promoting a healthier functioning body. Give this Chocolate Pomegranate Sorbet recipe a try for a cool summertime treat that reduces those annoying twinges of diet guilt. In a large saucepan, whisk together 1 1/2 cups of the water with the sugar, cocoa powder, and salt. Bring to a boil, whisking frequently. Let it boil, continuing to whisk, for 45 seconds. Remove from the heat and stir in the chocolate until it’s melted, then stir in the vanilla extract, the pomegranate powder, and the remaining 3/4 cup water. Transfer the mixture to a blender and blend for 15 seconds. 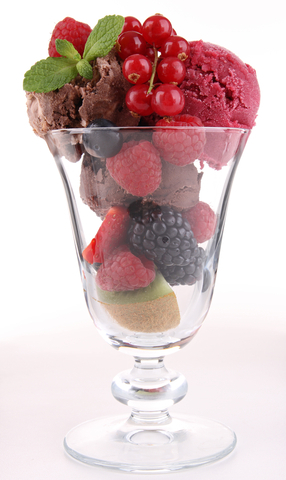 Chill the mixture thoroughly, then freeze it in your ice cream maker according to the manufacturer’s instructions.